Augereau, from very modest condition, engages at 17 years in the Prussian armies then Neapolitan. He is established fencing master in Naples. To the Revolution, he re-enters to France. 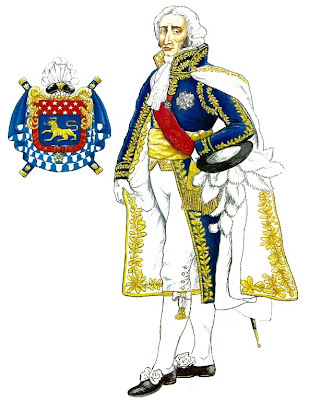 Initially private in the national Guard, he is, five years later, major general in the army of Italy.In April 1796, he takes the castle of Ceva, his first exploit under the command of the Bonaparte General. His bravery is illustrated in Lodi on May 10, 1796, when he springs in spite of the rain of Austrian grapeshot. August 3, 1796, his intervention at the time of the battle of Castiglione reverses the fate of the battle. In Arcole, November 15, he springs on the bridge with the head of his troops. Bonaparte grants his regard and his confidence to him, in spite of the rumours on his rapacity. He delegates him in Paris to subdue the royalist push, in September. It is the strike of state of the 18-Fructidor. Augereau appears terribly effective, carrying out with the letter all the commands of the Directory; he is then named commander of an army corps of the Rhine. Augereau, deputy of Haute-Garonne to the consulting of Cinq-Cents, is first of all opposed to the strike of state of the 18-Brumaire. He is closed to the Jacobins. He refuses the invitation of the banquet given in the honor of Bonaparte. He adopts nevertheless the Consulate the morning even 18-Brumaire, kissing Bonaparte and exclaiming: «How! You wanted to do something for the fatherland and you did not call Augereau!». In spite of his critics of the Legal settlement, he is reproduced on the list of the marshals of 1804 and attends the sacring of the Emperor. From September 1805 to February 1807, he receives the command of VIIème body of the Grande Armée. With the battle of Iéna, October 14, 1806, he beats the Saxon ones and crushes the body of Rüchel assisted from the Prussian army. In Eylau (February 8, 1807), ill, he is made attached on his horse on the beginning of the battle. Whereas he must tackle the Russian center, his army corps is lost in a snowstorm. The French soldiers are decimated by the enemy guns. Wounded at the arm, Augereau re-enters to France. March 19, 1808, he receives the title of duke of Castiglione. He is useful then in Spain. His first victories at the head of the Army of Catalonia are soon followed by defeats. The Emperor returns Augereau in his grounds but recalls him for the campaign of Russia of 1812 when he entrusts a body of reserve to him. The marshal is present at the time of the French defeat in Leipzig, from the 16 to October 19, 1813. His keen defense regains the favour of Napoleon to him. In 1814, the Emperor entrusts to him the army corps posted in Lyon. Augereau, which has commanded to cut the lines of communications of the army of Bohemian, compromises and refuses the combat. He is now notable. April 16, 1814, he launches a proclamation where he enjoints his soldiers to adopt the white rosette of the Bourbons and denounces Napoleon like a tyrant. The Emperor crosses out his name of the list of the marshals at the time of the Hundred Days and describes him as «traitor in France», when Augereau comes to propose his services to him. Louis XVIII income on the throne also draws aside him. Augereau is withdrawn in his properties, where he dies little after a chest complaint, without leaving children.Napoleon will say of him at Sainte-Hélène: «He was unable to act; he did not have an instruction, little of extended in the spirit, little education; but he maintained the command and the discipline among his soldiers, and was liked by them. He divided his columns well, placed his reserves well, fought with intrepidity; but all that lasted only one day: winner or overcome, he was generally discouraged the evening, that is to say that it was due to the nature of his character, or with little calculation and penetration of his spirit». Pierre François Charles Augereau, Duke of Castiglione, well distinguished in the Italian campaigns of Consulate. He's dressed with the ceremonial dress used by Marshals. Dark blue velvet cloth, gold embroideries of oak leaves, crimson sash of Commander of "Legion d'Honneur".